A photo a day, for a year. The excitement, the drama, the successes, and the failures. Day 7. July 15, 2010. 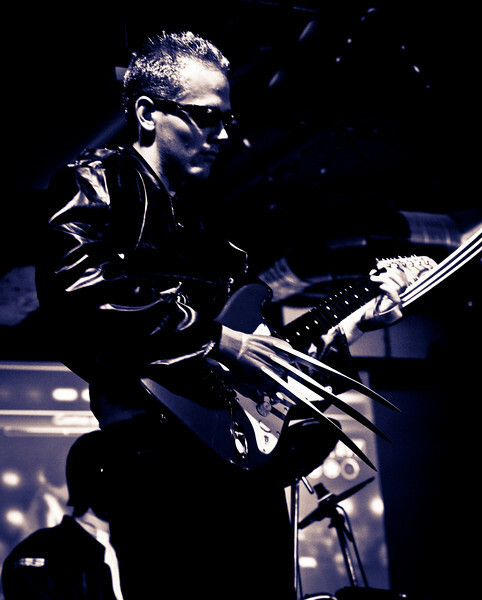 Wolverine rocking out at Palantir's Rock Band competition. The venue was fully decked out with a raised stage, stage lights, projected background, a large-screen monitor TV, multi-camera setup, a full bar, and various other accoutrements. Oh, and we were crowned champions, may I add. :) Taking sharp photos with dim stage lighting is extremely difficult. At ISO 1250 and f/3.2, I still had to have a 1/25 shutter to get enough light on the sensor, so there was a lot of trying to time my shutter clicks with when the player stopped moving for a split second. 17-55mm f/2.8 IS. f/3.2. 1/25. ISO 1250. And clipped a lot of the dark in post-processing, as well as the color stuff.